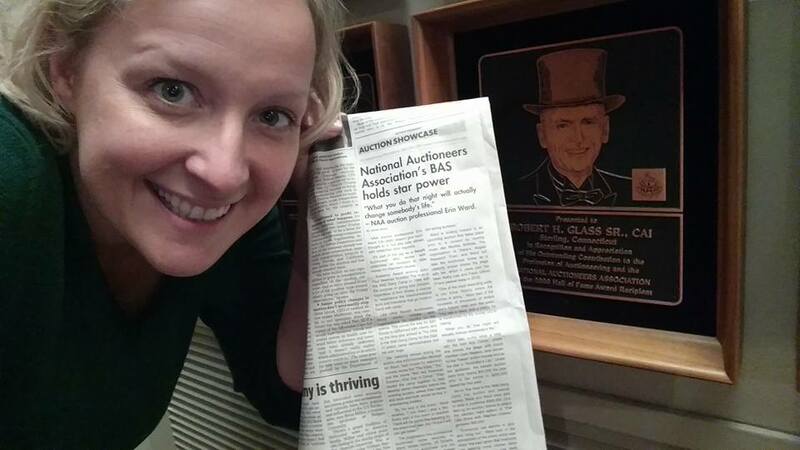 “NAA auction professional Erin Ward, CAI, BAS, doesn’t give much thought to it, but she rubs elbows with celebrities fairly regularly. It’s part of the gig as a Benefit Auctioneer who works with celebrities on occasion to raise money for important causes. Like other Benefit Auctioneers, Ward works closely with organizations for months on the organizations for months on the events. This paves the way for tight bonds to be formed with clients, and by the time she arrived at The Hole in the Wall Gang Camp for the Sept. 17 event, camp administrators met her with hugs. Her celebrity emcee during the auction was actor/comedian Michael Ian Black, best known for television comedy series like “The State,” “Ed,” and the movie “Wet Hot American Summer: First Day of Camp.” They toured the camp together to help develop some chemistry before the evening auction, where their banter and back-and-forth would be key in entertaining bidders. The progression into professional auctioneer came naturally to Ward, whose mother, Jill Doherty, is an estate auctioneer and the 2002 NAA International Auctioneer Championship Women’s Division Champion. Per her mom’s career choice, Ward attended many auctions as a child. Ward is looking forward to an upcoming auction that takes place prior to a concert music star Martina McBride. The organization is Dana’s ANgels Research Trust, and Ward will take the Auctioneer duties as a celebrity emcee shares the stage with her, which in years past has been Kathy Lee and Frank Gifford (Frank passed away in 2015). Ward also works once a year with the Irish Arts Center, where she shares the stage with board member Liam Neeson, best known for his “Taken” action movies and as a star in “Shindler’s List.” Under her guidance, the benefit auction went from raising $50,000 the year prior to her arrival to $250,000 raised her first year. As for the Hole in the Wall Gang Camp live action and appeal, Black and Ward were able to raise a combined $665,000. One item up for auction, tickets to attend the election night edition of “The Late Show with Stephen Colbert,” garnered $60,000.